This beauty is not yet a year old and is enjoying the outdoors with her family in Colorado. Love to see our puppies doing some of things they do best! Below is the update from Ida’s family. Ida is a daughter of our Mossy (now retired) and Cave. Ida learning to find sheds! She’s an amazing family member for us! Thank you so much for her. We love her so much! She’s been such a huge blessing. She sleeps with Hannah, who you met. She gets anxious at night and Ida stays right with her. We can’t thank you enough! Great job to both Ryder and his dad! 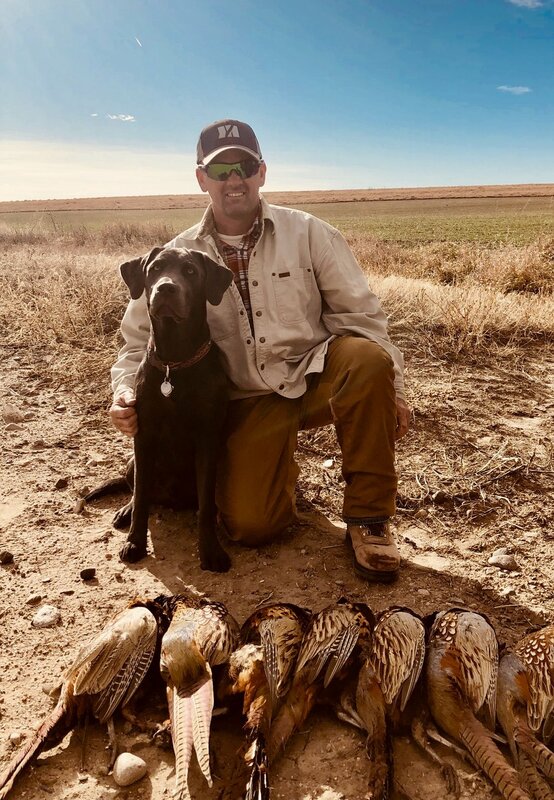 We received this update after a successful hunt with these two in Kansas recently. Ryder is a Stormy puppy from 2017. 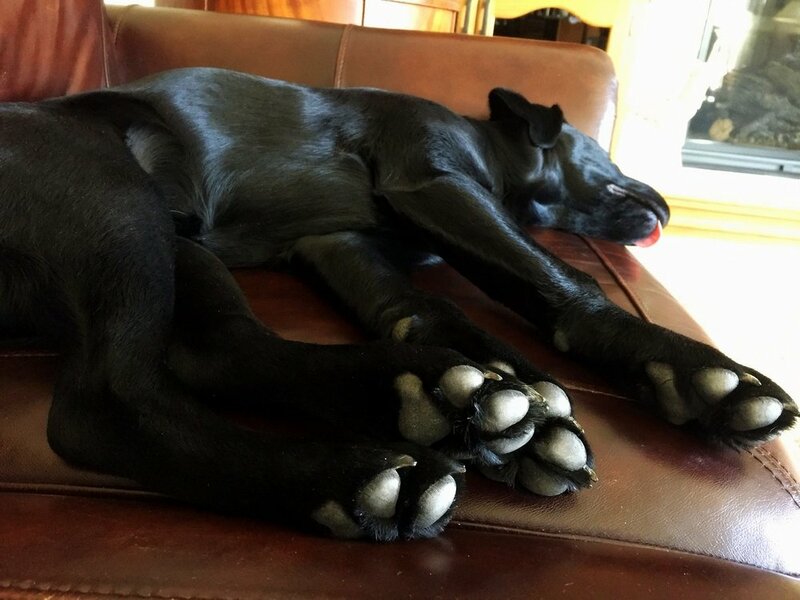 This charcoal girl (Tula and Gunther puppy) loves her humans and like so many Labs needs to just be beside them. 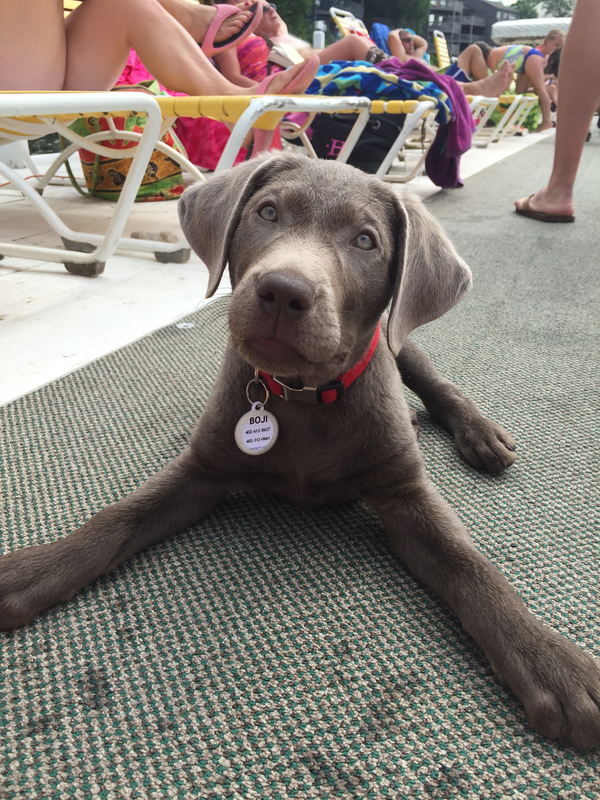 We love hearing the stories and how our puppies have become part of their family’s daily routine and lives. Thank you Katie, for sharing! “Miss Mabel is doing well! She is such a hoot when someone comes in with the newspaper (typically my husband or oldest son) as she hops right up in the chair to help read it every night! Some of her favorites are her food, cuddling on chair or couch, going for rides and long walks. We love her so much! 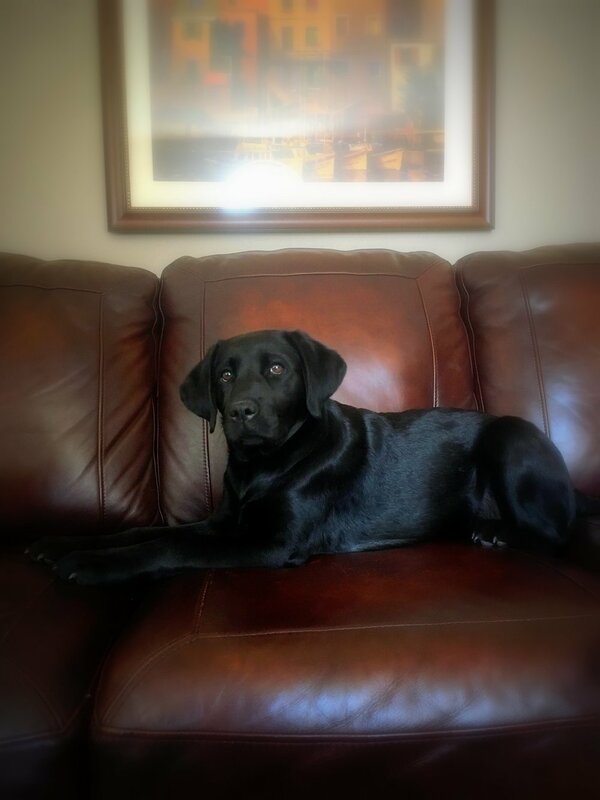 She is growing quickly and will likely struggle to fit in the chair with one of us soon. She is very tall and we hear that frequently from others that see her as well. Her coat is beautiful - her color is something that has people stopping me on walks to ask about. Mabel welcomes those encounters as she enjoys the attention!! Fall Storm Puppies Celebrate 1 Year! As we welcomed new Fall puppies, we received updates on our 2017 Fall puppies. Turning 1 year old, Stormy’s puppy updates came flowing in. Happy Birthday to the Fall Storm kids! How fast a year goes...wishing Gypsy, Sami, Bodie, Ella, Ryder, Mazie, Lincoln Lee, Mya, Wrigley, and Apollo! Pictured below is Miss Gypsy! I hope you both are doing well! It has been awhile since I've updated you on Lincoln so I thought I would send a quick email. He went to the vet today and is just over 35 pounds! He grew out of his puppy collar a few weeks ago, so Jesse made him a new one out of leather. We continue to be so impressed with his demeanor and how smart he is. A few weeks ago he discovered how to get the puppy gate open. He's always so proud of himself when he comes barreling into the living room after escaping the kitchen. I've attached a couple pictures - he was sleeping after his vet visit in the first one - he is such a funny dog. 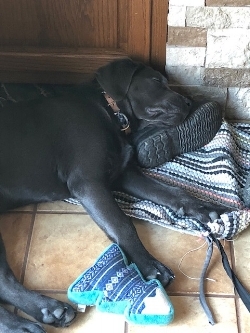 He will almost always grab a shoe or a soft chew toy to lay his head on when he naps. He has a bed, but always wants to nap wherever I am. He loves to play fetch and when he comes back with the ball or toy, as soon as you say "thank you" he'll release it. I came down with a really nasty flu bug right after Christmas and was in bed for five days - every evening, Lincoln would come find me and lay down with me for about a half hour. It was the sweetest thing. We all love having the little guy with us. 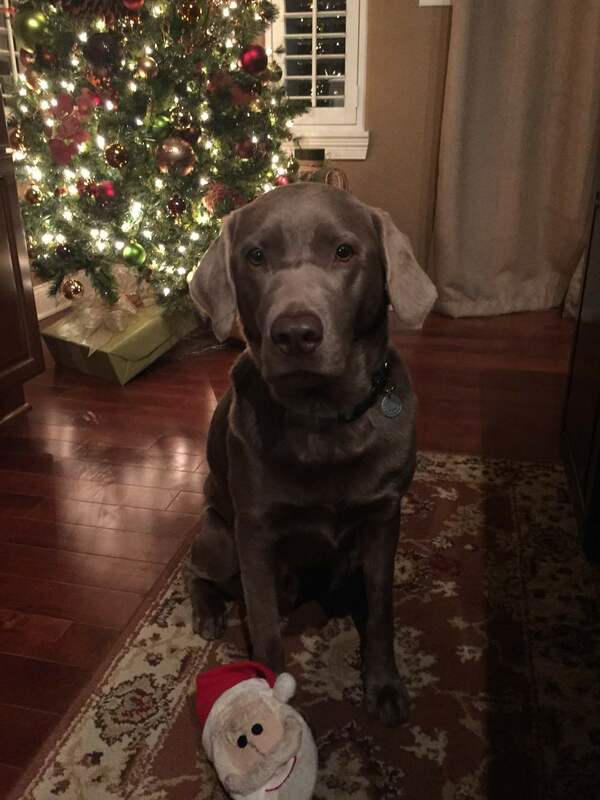 In December he stayed for one night at our Vet clinic while we took the kids to the St. Louis Zoo to see the lights. Everyone fell in love with him! We've had two vet visits since then and the staff always get so excited when he comes in - girls working in the back will come out as soon as they know he is there. 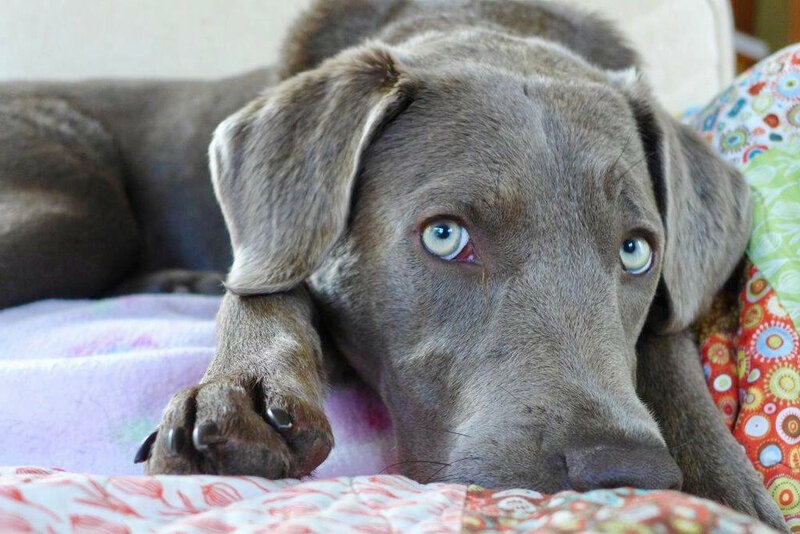 Our veterinarian cannot get over how beautiful he is - she's always commenting on everything from his eyes, to his color, to how symmetrical his features are. Lincoln is literally the perfect dog! He's smart, playful, cuddly, and puts himself to bed when he's tired! We got some snow here (about half of what you all got) and took him out to play in it. He LOVES being outside. I hope you and Joel are doing good. 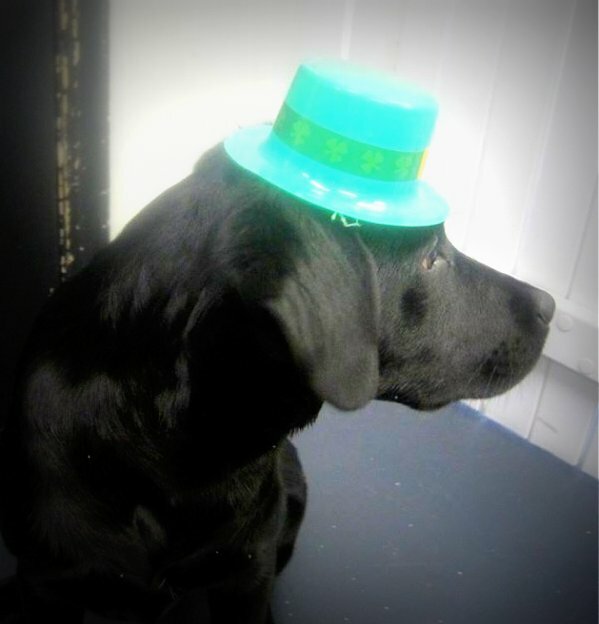 We have had so many people ask were we got Lincoln from and we are always more than happy to tell them CaveInn Labradors! We get so many compliments on what a beautiful and good dog he is! Mossy's puppies this past Spring were some of the biggest and fluffiest puppies we have had. Many may remember Mr Abe, one of the big charcoal boys. He is really growing up for sure! I just wanted to send you some pictures and updates on how Apollo is doing! He's growing, and growing fast. Our silver, Jax, and him are best buds, and have been since his first weeks home. We took him out to check trees and run the other day with Jax and he loved it! The grass was a little tall for him to maneuver, but that didn't stop him. He's a very confident and bold puppy, we love it. We started training classes for the AKC STAR Puppy. Turns out Apollo is such a good boy, he got moved right from his Puppy 1 classes into Puppy 2! He's in class with puppies that are 6 months and a little older. There's another lab in his class, and he's about the same size as her at only 4 months old! We love him with all our hearts, and are so happy we came across CaveInn when we did, he has truly been a wonderful addition to our family and we couldn't be happier. 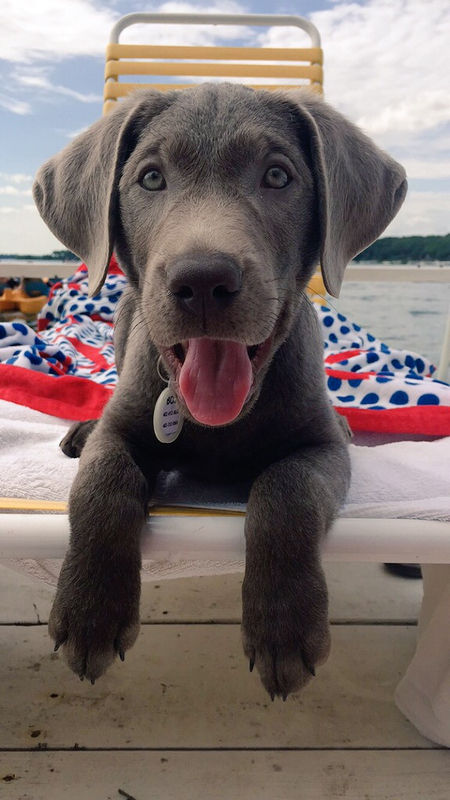 The holiday weekends are fantastic times to have fun with Labs. Here are a couple of fun pictures and updates from parents enjoying the last days of Summer. As summer comes to end I wanted to share a video and picture of Winnie she has mastered jumping off the dock and would be ready to compete except she cannot control her excitement around other dogs and would not be able to focus on the task at hand 😉. Her new games in the lake are fishing and bobbing for Lilly pads. We love this girl and her big personality. Hope all is well at Cave Inn. Duke has adjusted great! He's sleeping almost through the night, doing well with potty training and crate training, and knows a few commands (sit, stay, come, "go potty", "do your business"). :) His new favorite food is his puppy kong stuffed with frozen bananas and blueberries! He is signed up to start puppy kindergarten late September and we can't wait for that. Billi and Cave's little gangsters were so colorful and fun. We were able to keep a couple a little longer because of the distance they were going to travel home. This update was nice to hear this week from Mr Fingers now Makoa and his family. He is growing up to be quite handsome and enjoying his mountain home! Makoa aka Mr. Fingers is down for a little nap, so I thought I would take the moment to tell you how he is doing. He is such a wonderful dog! Obviously, he is very much a puppy and a lot of work, but we were prepared for that! In the week and a half he has been with us he has learned come, sit, down, drop it, leave it and is getting there on out and off. He is a very smart boy! It is clear that we will have to make extra effort to keep his busy brain from being bored, but that's ok! He is also quite the snuggler, as you noticed early. He loves his belly rubs, snuggles and naps on laps when he is sleepy. We are thrilled to have him as our new family member! Attached are a few pics. Hope you all are doing well with all your other little pups! When Range was born, he was one of only three in his litter. His mom, Tula, was very attentive to almost a fault. These three boys grew pretty fast and before we knew it Ranger was really a tank. We put special bumpers in the whelping box to keep him on his side to keep him from being a swimmer puppy. We knew Ranger was destined for special work and as he grew he proved to be an ideal student. This also has so much to do with Ranger's parents and family. It takes a lot of dedication, patience and great care to achieve what Ranger has in this short period of time. Congratulations to Ranger and his family! Great job!! 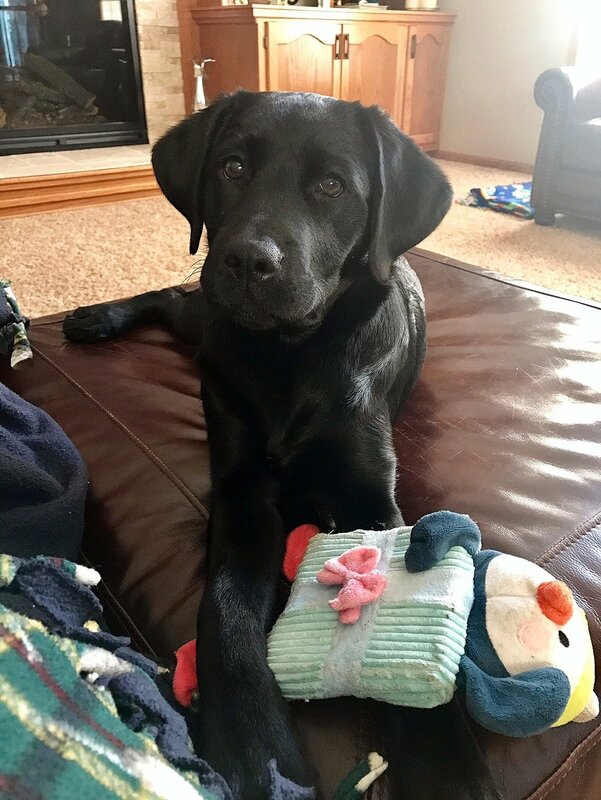 Ranger earns AKC CGC and S.T.A.R. Puppy! Just wanted to check in & fill you in on all of our adventures with Ranger lately! As you know, Ranger was enrolled in the K-9 Good Citizen Obedience class. Today he earned the following certificates: the AKC S.T.A.R. Puppy, the AKC Canine Good Citizen, the AKC Advanced Canine Good Citizen, and the Urban Canine Good Citizen! He was the class favorite. We are so proud of him! We will keep him in training until we feel like he is ready for the Therapy Test. He is still quite a baby, but has done a terrific job. He just turned 10 months old and is weighing in at 87.5 pounds (with one foot off of the scale 😂)! He has been a big boy from the start. These are snippets from a few of Ranger's first day with his family. We are thrilled to see his happy face at home. When I post an update on ourFacebook page it is followed by more updates from other parents. This is a great feeling to know they all love to share their puppy progress with other parents. Ranger is doing great here! Can you believe he has not yet pottied in the house??? He actually GOES TO THE DOOR when he has to go out! This started the morning after we got him here. He goes right down the stairs and walks right into the grass. He potties within 10 seconds every time! When he's ready to come in (he's always so hot!) he walks right back up the stairs and SCRATCHES on the back door! When I tell him "let's go outside", he starts going to the door. We are absolutely amazed. He has done so well with his crate, too. Only one night he yelled for awhile but he has gotten the hang of it! Last night he only went out once! I mentioned Ranger is always hot. He finds where the air comes out and lays right under it. He also needs a fan on him in his crate because otherwise he pants in there! Lol! We say he's hot because he has the fur of a Polar Bear! He also drinks a lot of water! He is such a precious gift. Thank you so much for all you did for him. We will continue to follow all your posts and look forward to Moon & Mossy's litters! I thought I would give you an update on Bella (formerly Sloane), since she turned one years old last weekend. I have attached a recent photo. Bella is such a sweet and happy dog. Friends and family often remark on her calm temperament around all people. She will lounge all day or blaze a trail in our local state parks with equal passion. We have been asked by several people including our Vets office, where we got such a beautiful well mannered dog. 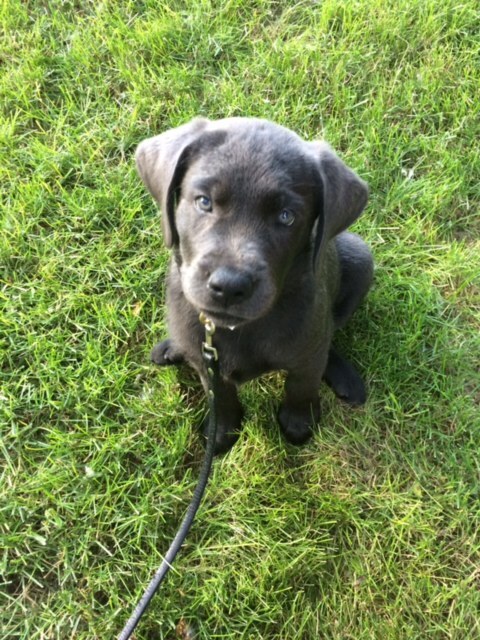 Bella quickly mastered the sit, shake, and lay down commands among others. She quickly learned potty training and rings a bell when it is time to go outside. She quickly graduated from crate training and has had the run of the house for several months now with no problems. Bella and our two cats (Buc and Bronco) have also learned to happily coexist in the house. We were so fortunate that we found your website, and we were able to bring Bella into our lives. Thank you for breeding and raising a great dog that has become such an important part of our family. Those first few weeks with a new puppy can be challenging. 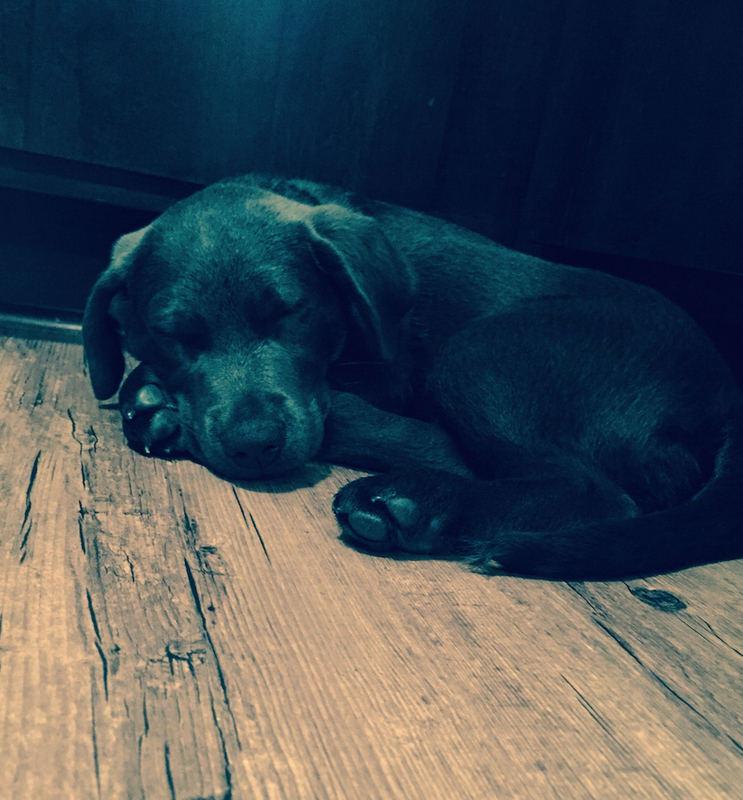 Housebreaking and getting to know your puppy and him getting to know you and his new home. This update from John and Michelle was so wonderful. 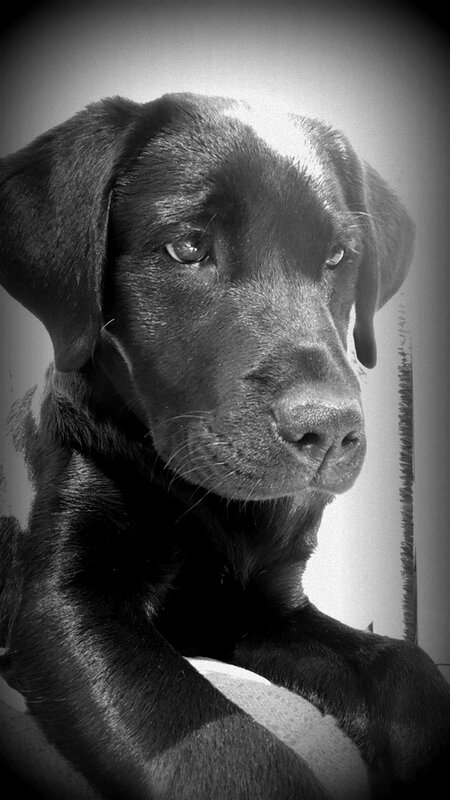 Nox is a Tula and Robin puppy born December 2015. John and I just wanted to touch base with you and tell you how awesome Nox is! He's adjusted very well to his new home and family. We started crate training him late this week, and will continue working with him to nail down this whole potty training thing. He's also starting puppy socialization class next week! I also wanted to let you know that I took him to the vet on Tuesday, and Dr. Anderson was very impressed with you and Joel as breeders. She had great things to say about the obviously great medical care and love he received before leaving you guys. Nox has a clean bill of health! We love Nox so much! We honestly could not have asked for a better dog! Its hard to think of him as an adult dog, because we're enjoying the puppy stage so much! He is very handsome! From the moment this guy was born we thought he was a spitting image of his sire, Robin. Good job John and Michelle. They were very prepared for the puppy experience! This time does go by fast and they out grow this initial stage so quickly! This handsome silver boy is a Pidge and Robin puppy now 6 months old. We are fortunate to get frequent updates from his parents. They say he is a very gentle soul. Recently, they brought a new kitten into the family and as you can see below Slate now has a new best friend. This kind a true friendship takes more than a gentle nature. Slate's parents take their role as puppy parents to heart. They have built a bond with him that takes consistency, time and discipline. We applaud their commitment to their fur kids to make a home that is full of unconditional love. "Look how cute he is!! We love his looks and so does EVERYONE else. He's famoous at all the places we go. He's such a good boy. We joke and call him a LabriCAT...because he is such a lover and always wants to sit ON my lap." These are heartwarming stories to read. We appreciate all our puppy parents do to make the lives of CaveInn puppies all they can be! Once again a heartwarming update from puppy parents. We never get tired of hearing from our parents near and far no matter how much time passes. Love seeing our puppies thrive! I had a little extra time this morning so I thought I would send you a little update on Nino. A couple weeks ago Kelsey and I were talking about how house training was going so well and he wasn't having any accidents but he wasn't letting us know when he needed to go outside. We talked about training options on how we were going to teach him how to communicate that too us. A couple hours after our discussion he wandered to the door and waited there for us to take him outside. And he has been going to the door ever since. It amazes us how smart he is. He catches on to everything so quick and seems to remember everything. He has now started hiding bones around the house. We will think a bone we gave him is gone and it will show back up a couple days or a week later. He is growing like crazy overnight and was 21 lbs at his last vet visit for some shots. He loves going on his nightly walks. On our walks he loves to smell everything, be very observant, and makes sure to walk through any puddle of water he can find. Everyone comments on how handsome of a puppy is he. We couldn't agree more. He is so sweet to anyone that approaches him to give him some attention and he loves it. We can't thank you both enough for everything you did. Not just breeding amazing puppies but what you do even after they are born before they go to their forever home. 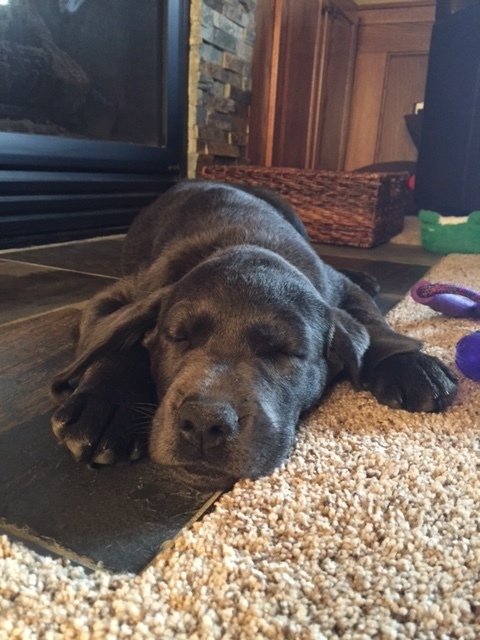 The more we see our charcoal puppies grow, the more we love the color. 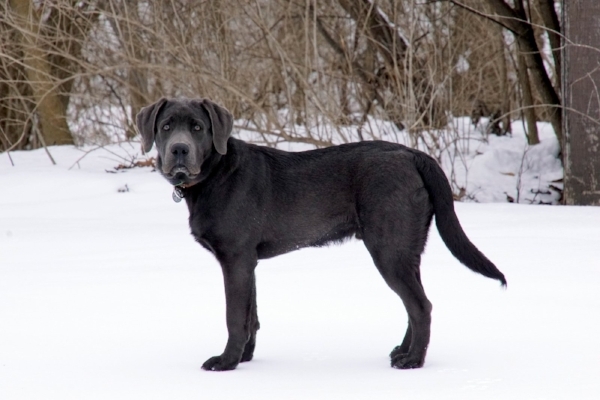 I've often said that we are color blind as we truly love all colors of purebred Labradors, but the charcoal is so very unique each time we get an update. The photo on the right looks like it could be a painting....hmmm not a bad idea! Mossy and Robin have the most laid back, obedient puppies. As Miss Mossy relaxes and enjoys the pack until next year, we will enjoy every update we receive from parents. We took him to the vet for his 12 week check up and he weighs a healthy 25 pounds! People just gush about how handsome he is and we can't get over how big his heart is and how fast he catches on. He knows how to sit, shake, and lay down on command. We are working on stay and come, and he gets better every day. We hung some bells by our door and he lets us know every time he needs to go outside by ringing the bells with his little nose. He is very observant and loves to be right at our feet. At night, he walks right into his crate and goes to sleep. He has been sleeping through the night for a while now, and we love waking up to his happy, smiley face. We can't get over how perfect he is! You both have done a wonderful job breeding smart, healthy pups and we are so grateful to have Jax. Thank you! I have included some pictures, he is growing like a weed. So great to hear from new parents and know our puppies are settling in so nicely! Thank you Kayla! We just wanted to tell you guys how happy we are with choosing Cave Inn as our breeder! The entire experience with you guys from filling out the puppy reservation form, to keeping us updated on social media and finally, picking up Boji was nothing short of perfect. Zach and I talk about all the time how you can totally tell our dog came from a quality place. 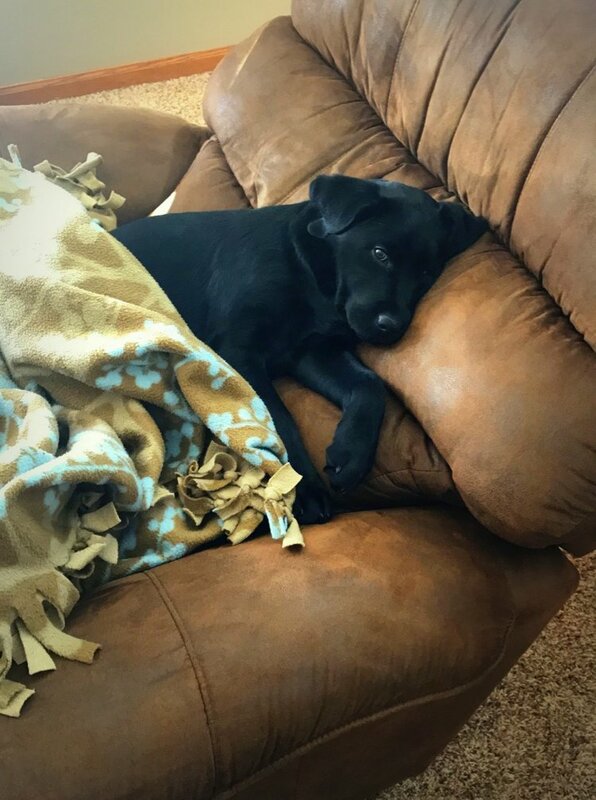 Before I got a puppy people warned me "you won't sleep for weeks" "having a lab puppy was worse than any of my kids when they were babies" "labs are extremely hyperactive until about age 4 then they calm down"...but Boji has proved everyone wrong. He has the best temperament, follows commands, can walk on a leash, is fully potty trained and crate trained and is only 10 weeks! We could go on and on forever about how perfect we think he is but I'll just stop there ;) Again, we just wanted to thank you for such an awesome experience and such an awesome lab. 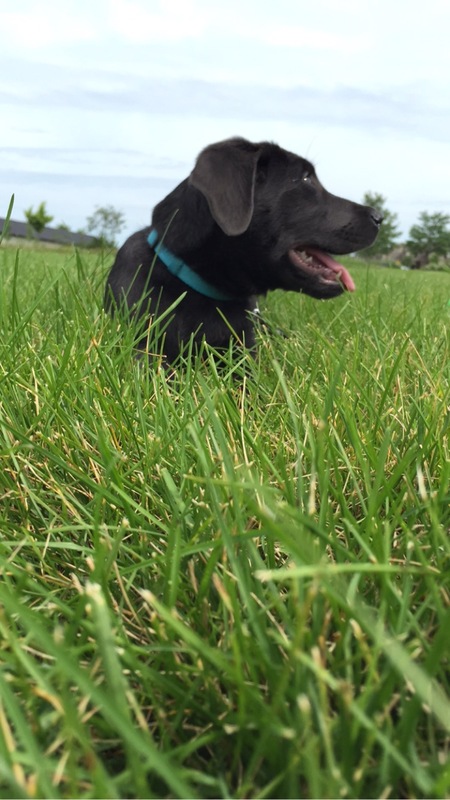 Ps- we have already been talking about purchasing another lab from you guys! This was a special greeting from a Pidge puppy. June was the only silver female in the litter and also was the largest. When we talk about our extended fur family, we truly mean they are extended family. To hear from our parents at this busy time of year is such a blessing. All we ever hope for! We wanted to wish you a Merry Christmas and tell you June is doing great! She is a very happy dog. She spends many of her days running and playing with her friends outside at Doggie Daycare. 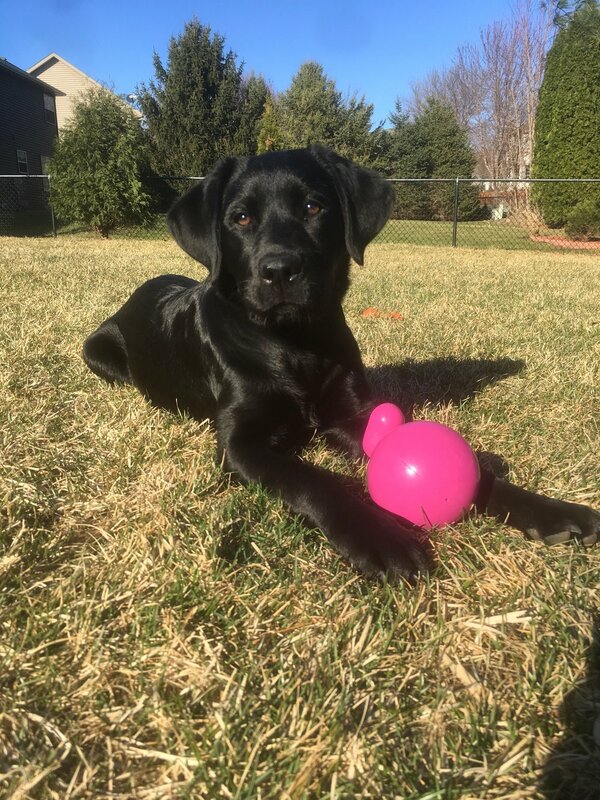 They tell us she is the most friendly, well behaved dog and is often their chosen "training" dog for new pups that are just learning to socialize. She still loves chasing bugs and stealing slippers. June has also developed a funny quirk that we have never really figured out.....she always, always walks backwards into the bedroom. We attached the video and some other Christmas pictures for you. Thanks for giving us such a wonderful family member, she's just the best.